Please welcome our new local unit chair, Zak Thatcher! Megan Hill has resigned from United and is pursuing her career elsewhere. We wish her all the best and thank her for her service. Upon her resignation, we are excited to welcome Zak Thatcher into the role of local unit chair. Please give her a warm welcome into this role. In other local unit news, Teresa Huizenga has stepped down as a grievance officer as she is retiring. Join me in thanking her for her service and dedication! Questions? Contact a local unit officer or WSNA Nurse Rep Sue Dunlap at sdunlap@wsna.org or at 206-575-7979, ext. 3005. 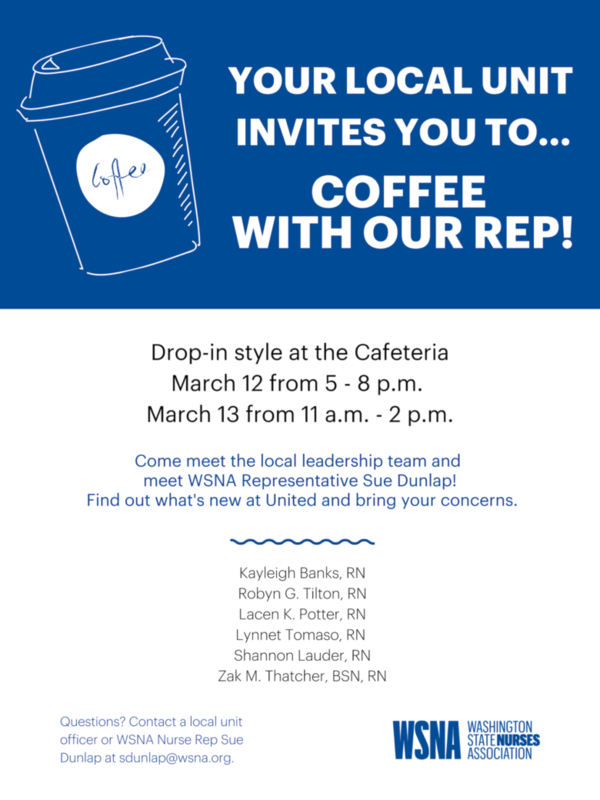 Your local unit invites you to coffee with our rep! Come meet the local leadership team and meet WSNA Nurse Representative Sue Dunlap. Find out what's new at United and bring your concerns. The meeting is drop-in style in the cafeteria. March 12 from 5-8 p.m.
March 13 from 11 a.m.-2 p.m. Questions? 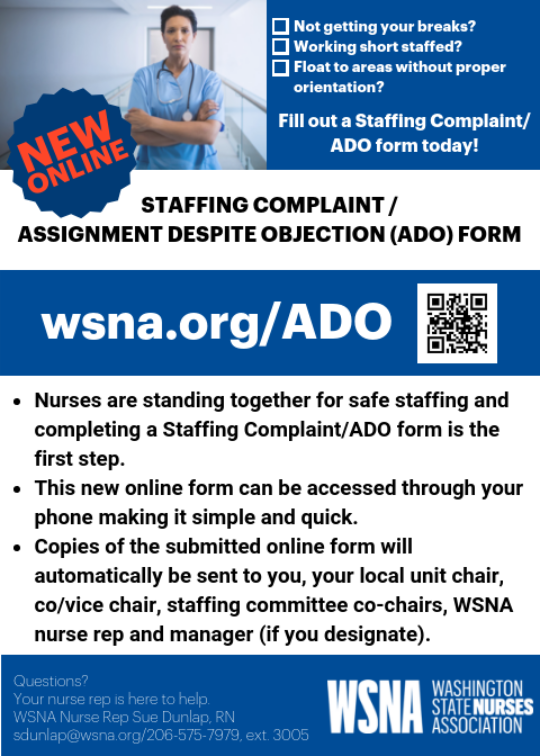 Contact a local unit officer or WSNA Nurse Rep Sue Dunlap at sdunlap@wsna.org. Please welcome WSNA Nurse Representative Sue Dunlap, MN, RN, COS-C! Beginning Monday, Dec. 10, 2018, Sue will be taking over all issues as they arise at PeaceHealth United General Medical Center. I will be assisting Sue with this transition in the coming months as needed. It has been a pleasure working with you over the past several years. I am continuing my work here at WSNA as a nurse representative with new assignments. I will miss you all but know you will be in good hands with Sue. Please drop by with any questions or concerns. It is a drop-in meeting and all United General nurses are welcome to attend. Questions? Contact WSNA Nurse Representative Barbara Friesen at bfriesen@wsna.org or at (206) 575-7979, ext. 3056. Thank you all for coming in to vote on the new contract. We hope to have the final copies online in the next few weeks, but most likely it may be after the holidays. We believe retro pay will be paid out on your Dec. 29th check, although payroll hasn’t yet confirmed if that can be accomplished. We want to thank the nurses who generously donated their PTO to help offset the loss of income for taking time off to negotiate the contract. We are sincerely touched by your donations. For those who did not get the opportunity to donate, you still can do so. You can either print the PTO donation form found here and return it to any of the negotiating team members listed below, or you can get a form from one of the members and return it to them. Please consider donating an hour or two of PTO to this team that worked hard getting you a great contract.